Displaced families, disinterested physiotherapists and a sense of despondency. This is what greeted Prof. Kavita Vemuri when she initially set out to study plasticity of the brain at rehab centres. 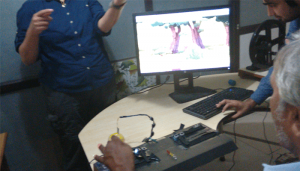 She found her ‘why’ in the lack of motivation witnessed in stroke patients there and thus began the Serious Gaming lab at IIIT-H. Read on to find out how the lab harnessed the power of belief in post-stroke recovery. Tucked away in a corridor of one of the older buildings on campus is a door seeming to make light of the serious research that takes place inside with colourful emojis on it. “The different emojis have been chosen to represent the students’ personalities,” explains Kavita Vemuri who heads this independent Cognitive Science research unit. To illustrate the depth of work that goes on here, Kavita begins by explaining the concept of serious gaming. Much like regular games that possess the elements of competition, collaboration, and a sense of achievement via a reward thrown in, the genre of serious gaming is all that and more. 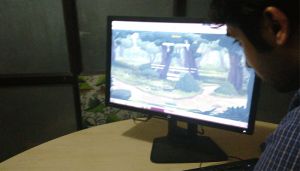 Kavita says that with serious games, the intent is to motivate users through complex or boring tasks by deftly weaving a learning objective with a fun task. In this way, people don’t realise that they are consciously learning something. Researchers at the Serious Gaming lab are currently working in domains such as neuro-rehabilitation, simulated games for the Army as part of warfare training and in the realm of urban planning as well. In the urban planning context, the game is an interactive and insightful technique of determining choices city dwellers make and seeing how they negotiate. For instance, Kavita says, “Given the knowledge of factors such as the level of pollution (both air and noise), proximity or otherwise to the workplace, you can see the choices others are making, like buying a house in front of a thoroughfare because perhaps they see an economic value to it.” Serious gaming finds applications in various clinical conditions too such as the treatment or correction of amblyopia, or ‘lazy eye’. ”Children don’t like to do the set of exercises that the clinician typically prescribes, it’s very boring for them,” she says. All the games from this lab and the physical systems (including the hardware) built around clinical conditions have been designed in collaboration with certified doctors. Over the past decade, the incidence and prevalence of stroke in India has been on the rise. And unlike originally assumed to hit people in their 60s, it can occur at any age due to multiple reasons. Rajat Singla, one of Kavita’s students actively involved in designing hardware and the games for post-stroke or brain injury-related paralysis or accident-related injuries, avers that for such patients, it is necessary to regain basic body movements. “The ability to take a few steps to go to the bathroom, to eat unassisted or even to regain basic motor control of the fingers for an IT professional to use the computer, is very crucial. Typically such a patient is depressed and doesn’t want to undergo physiotherapy or any exercise because it is painful. But exercise is important to regain muscle control and get back some amount of normalcy,” he says. Referring to the plasticity of the brain where the largest organ is uniquely programmed to rewire itself in the event of damage, Kavita says, “When there’s a stroke and a clot is formed, leading to reduced blood flow (atherosclerosis), the brain cells in that particular area die. But with rehabilitation, there is a theory that the brain reassigns another area to take up the lost function. The more such patients exercise, the more they benefit. It is not the muscle that is dead but the brain part controlling it that is dead in some types of strokes.” Functionality transfers might explain how double amputees of the hand can write with their feet. The brain forms new connections with nerve cells and learning of complex motor movements is achieved. The point of serious games is to get patients to even try these exercises under the guise of fun. Lower limb weight balancing or gait balancing game: This is a sensory surface mat fitted with load cells used in weighing scale machines, that records movement such as weight on each leg, pressure applied and how quickly the patient is able to shift from left to right, forward and backward and so on. 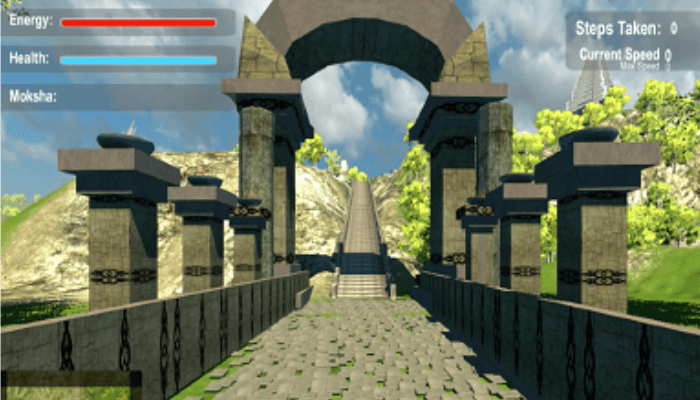 “Like the iconic Temple Run, this game itself is an avataar that is made to run, go collect gold coins, and when there is an obstacle, it has to make a complex dance-like manoeuvre,“ says Rajat. Hand Movement: This is another setup which incorporates a game where movement in the hand is induced. The system is a sensory circuit on which the hand is being moved. Every movement of the patient’s hand is translated into an action in the simple game which involves catching apples. Early studies by the Serious Gaming lab showed that immersiveness of a game interaction makes patients exercise longer and with minimal assistance as compared to traditional exercises used in daily therapy sessions. It was during such patient interactions that the team also realised they could up the motivational quotient of the games by harnessing the power of faith and religious beliefs, which is of importance to patients. 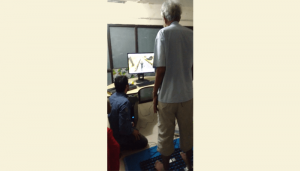 Finding it a common practice to pledge to climb up the foothills of Tirumala as an offering to the Lord, Rajat says they designed a system where the step-climbing was simulated for patients through a game. It even included the mini-temples one encounters enroute with appropriate devotional music.“If a patient believes he or she is going to get better by praying to God, we, as scientists or researchers do not question that hope,” says Kavita. To test the theory of the power that religious beliefs have on patients, they replaced ‘Virtual Tirupati’ with a trekking game. This game had villages, coffee shops and little houses en route. When a comparative analysis was done, it was found that Hindus showed a clear preference to the temple game as opposed to those belonging to the Christian faith. Christians showed a preference for the trekking game. Since then, the game has been planned for different faiths, with a step-climbing simulation created for a Goan church. “Who is the God is not important for us, but the question is if I can motivate people based on their belief structure,” says Kavita. Remarking on the low rate of recovery of such patients in India, Kavita says that what typically takes around 3 months for a stroke patient to recover in the West takes over a year and a half in India. There are a multitude of issues at stake here. Rehab centres are more often than not located in urban areas, necessitating a relocation of entire families of the rural poor, impoverishing them. These centres are also not completely equipped with infrastructure required in India. If they are, it is rare and prohibitive in terms of cost. The USP of the Serious Gaming lab is not only to build cost-effective hardware such as the sensors and gesture recognizers but also to deploy systems that can be installed in rural primary healthcare centres with just a technician to supervise the usage. With a doctor in an urban setting getting access to the data, patients and their progress can be monitored remotely. “In principle, the patient’s family need not move and life need not be disrupted for them,” says the team. Organized rehabilitation services found in private hospitals in cities are prohibitively expensive. Built at a fraction of what such sophisticated equipment would cost, the group’s designs are modular in nature. “Every stroke patient’s ability is different. So we’ve designed it in such a way that it can be completely changed as per the doctor’s wishes to fine tune to individual cases. If the patient can move only so much, the entire setup can be reorganized to allow for only that much, if the patient says he wants to rest his elbow while moving his arm, he can do that, if he doesn’t want to squeeze a ball due to lack of ability, that part/action can be omitted from the game,” Kavita explains. The game itself is designed such that there is minimal cognitive load on them. In other words, they won’t have to engage in complex thinking while making muscular movements. While stating that there are various organizations working on different aspects of stroke recovery such as NIMHANS, Bangalore for speech therapy, Kavita says that governmental intervention in the form of funding, the involvement of corporates and so on is the need of the hour for her team’s efforts.As a research lab, the team builds and tests prototypes, but they were on the lookout for startups to polish the looks and create a cleaner interface. Their search ended at CIE where they handed over their systems used for rehabilitation exercises of the limbs to a startup, SOUJHE Innovative Healthcare Devices. Soumitra Das, the founder says that their aim is to come up with IoT-enabled gamified rehab devices for stroke and accident patients. “This concept is already well known in the world but in India, the rehab industry is unstructured and growing gradually. Importing rehab devices from abroad is an expensive affair. Our goal is to come up with Made-in-India affordable devices for the common people”. With the current customer focus on rehab centres and hospitals, the startup is working on prototypes for balancing the body, finger and wrist, and shoulder and elbow devices. What next then for the neuro-rehab serious gaming team? “There are 18 exercise therapies that are part of the standard stroke rehabilitation regime. We’ve designed games for 4 of them and I want to complete building the whole suite, which is when as a researcher, I’ll be happy.” signs off Kavita.